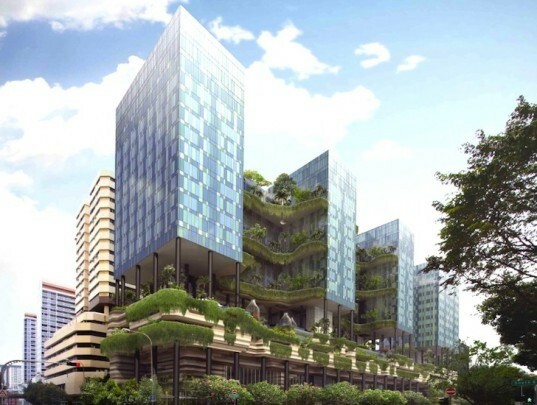 WOHA Architects are completely changing how skyscrapers are built with their Park Royal Tower in Singapore, which will feature twice as much greenery as the nearby Hong Lim Park. The high-end office and hotel tower features a podium absolutely overrun with vertical gardens, contoured green pathways, water features, and leafy terraces. When it is completed later this year, this groundbreaking project will boast a whopping 15,000 square meters of green space! Park Royal’s leafy podium on Pickering is designed to be a vertical extension of the Hong Lim Park right across the way and at 15,000 square meters of natural features, is twice as large! The contoured facade is planted with shade trees, palms, overhanging creepers and a variety of other plant species that not only disguise the above ground parking lot but also scrub the air clean of any emissions produced there. This isn’t a skyscraper. This is a jungle in the sky that just happens to accommodate business travelers and office workers. Although the building is constructed out of concrete, which has a high embodied carbon footprint, the overall environmental impact is mitigated by the extensive planting and kept to a minimum with pre-fabricated parts and open sides that promote natural lighting and ventilation throughout the building. Rooftop photovoltaic panels will provide energy for reticulation and softscape lighting and a rainwater harvesting system will ensure that no new water will be used to irrigate the green spaces. In other words, this ambitious urban design will be almost completely self-sustaining. It’s no wonder, then, that it has received Singapore’s Green Mark Platinum score, the nation’s highest environmental certification! Is this on the 181 kitchener road ? @FreedomRebels: Hempcrete has low compressive strength and low ultimate strength, so it's not suitable for high-rise building. Besides, hempcrete is not easily available in Singapore. Unless there's a way to use it without extra expenses, using hempcrete is not a good idea. If they had built the tower with Hempcrete, the carbon foot print would have been almost zero, and the Hempcrete would continue to absorb carbon out of the atmosphere inside and outside the building just like trees do, and as the Hempcrete ages, it would continue to get stronger and last a thousand times longer. 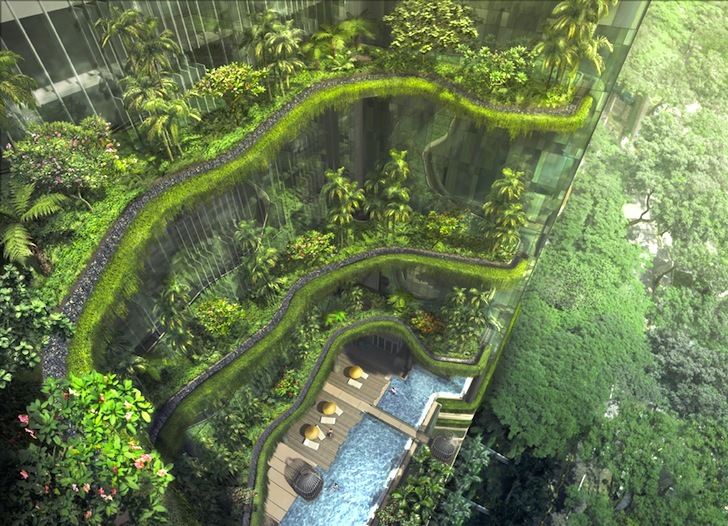 Creepers, palms, flowering plants, shade trees and a variety of other flora will adorn the veritable jungle in the sky! An upscale hotel tower and office building, Park Royal will also feature a variety of water features including waterfalls. Despite being constructed from concrete, the immense planting helps to mitigate the project's overall footprint.